Home › Blogs › I'm back! While I love my mac for the graphics, watching movies and of course Itunes and Ichat, I missed the simple things I could do on a PC like right click... who would have thought you couldn't on a mac? Anyhow last night Joel got the Internet upstairs, so now I need to get back to organizing this room. There are cords everywhere that I will be sure to label this time around! While Chelsea was home over the weekend she wanted to find something to read. A couple of her classes are almost an hour apart and by the time she would walk back to her dorm she would have to leave for class. So she thought a good book would fill the time while she waited for her next class. We went to Borders and looked around for a while and finally asked for help. 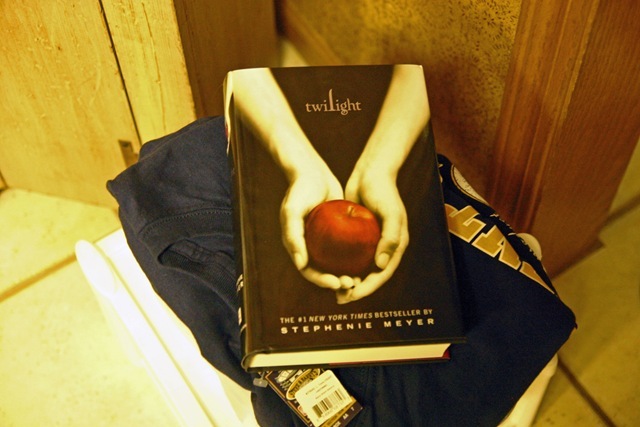 The girl gave us several recommendations and what we ended up leaving with was Twilight? I'm pretty sure I heard some of you mention you were reading this series and loved it. I figured Chel could read then pass it on to me. Let me know if you read this and what you thought of it? Since being without my PC I've also found myself addicted to Facebook. If you have an account be sure to look me up and if you don't - you need to check it out! Finally getting back to working on some projects too with my Work in Progress kit. I need to scan my pages so I can upload them. Also gearing up for some fall projects. When my girlfriend closed her store she gave me lots of unfinished boxes and craft projects. 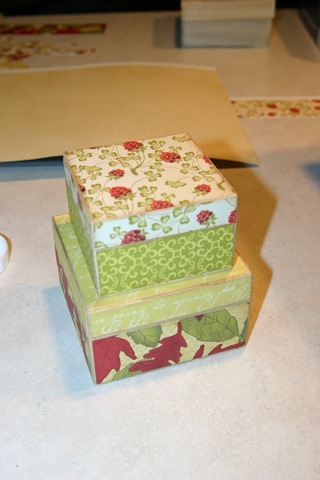 This is from a set of 3 nesting boxes I am still working on.